Oil on canvas, 43 x 67 cm. During his second stay in Italy, Zahrtmann completed a number of genre paintings based on the locals he met along the way. 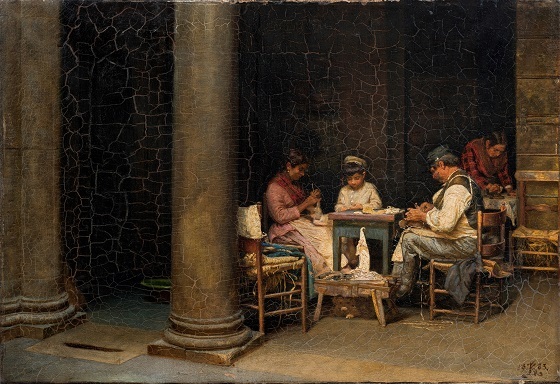 His genre paintings of the Italian people are often characterised by an unpretentious and relaxed atmosphere. At the peaceful farm of Palazzetto Farnese, a hard-working shoemaker is depicted sitting at a table with his wife. A boy stands at the end of the table, looking on with curiosity at what the adults are doing, while another woman is busy ironing in the background. Each of them appears in a state of deep concentration and entirely unaware of their surroundings.